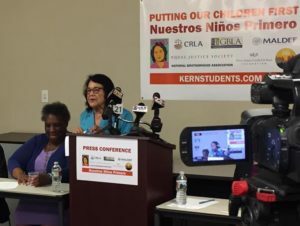 In a substantial victory for the Dolores Huerta Foundation, Latino and Black students, their parents, and community organizations, Kern High School District (KHSD), the largest school district in California, agreed to settle a lawsuit in which DHF charged KHSD with disproportionately suspending and expelling students of color due to implicit bias. The settlement requires that the district implement positive discipline practices to address disparate discipline outcomes and provide discipline-related training to all staff and personnel operating within the school environment. The lawsuit also includes terms which will allow advocates to work with the district to ensure that these reforms are actually implemented in the future. “This is a major step forward. We intend to work with both parents, students, and KHSD to ensure that what has been agreed to in the settlement will actually be implemented and respected. This is also a strong message for the rest of the Central Valley. 40% of the school districts that have the highest suspension rates of Latino and African American students in California are located in the Central Valley. What we see happening here in Kern County is happening throughout the Central Valley. So we’re going to continue to work in many other school districts to make sure our Latino and African American students are being prepared for college so we can dismantle the school-to-prison pipeline.” said Dolores Huerta. · Use nationally renowned experts selected by counsel to track and evaluate discipline-related data with KHSD’s current consultants for 3 years. · Provide mandatory professional development and staff training for teachers, school police, and security, and other classified staff. · Hold community meetings twice a year to present the public with timely discipline-related data and to allow the community to provide input. Background: In October 2014 California Rural Legal Assistance (CRLA), and Greater Bakersfield Legal Assistance (GBLA), and MALDEF filed a lawsuit against the Kern High School District (KHSD) on behalf of the Dolores Huerta Foundation. The legal action specifically challenged KHSD’s discriminatory disciplinary policies and practices. Individual plaintiffs and community based organizations involved in the Kern Education Justice Collaborative (KEJC) later signed on, including Building Healthy Communities – South Kern (BHC-SK), Faith in Action Kern County, National Brotherhood Association, and Children First. later joined on to the lawsuit. The lawsuit was filed in response to data provided by the U.S. Department of Education’s Civil Rights Office showing that Kern County schools were suspending and expelling African American students at a rate 500% higher than Caucasian, and Latinos at a rate of 380% higher. KHSD had the most student expulsions in all of California. Schools in Kern County reported 2,578 expulsions among a student population of 173,365. Astonishingly, in terms of raw numbers this was even more expulsions than Los Angeles County which had a student population nine times larger. To make matters worse, expulsions disproportionately affected students of color. Whites were 32% of enrollment and 22% of expulsions. Latinos were 55% of enrollment but 60% of expulsions. Blacks were 8% of enrollment but 15% of expulsions. The majority of expulsions were for offenses in which administrators had discretion to recommend a punishment other than expulsion, such as fighting, being intoxicated, or engaging in “willful defiance,” a highly subjective, catch-all, category that is so vaguely defined as to include any form of disobedience such as classroom disruptions, cursing, etc. Safety, therefore, was not the primary factor in such high expulsion rates. Rather, it was a zero-tolerance, law-enforcement-first mentality attitude to school discipline applied by administrators within school communities. When asked to explain the inordinate expulsions, KHSD administrators responded by claiming it was done in the name of safety and there had been no call for a change from students’ parents or the community. Kern County schools were clearly doing a disservice to a substantial percentage of their students by removing them from a path to graduate on time and to begin college or a career. Recent research shows that students who are expelled or suspended are more likely to dropout and/or go to prison. With an expulsion rate of 15 per 100, Kern schools funneled thousands of its students into the school-to-prison pipeline and made them more likely to end up in prison or on some kind of public assistance. Dolores Huerta Foundation took action partnering with “Families in Schools” to build the capacity of like-minded organizations through funding and technical support in order to engage parents, families and the public in the decision-making process. In 2012, the Dolores Huerta Foundation partnered with Building Healthy Communities – South Kern (BHC-SK) to convene the Kern Education Justice Collaborative (KEJC), whose members include the Dolores Huerta Foundation (DHF), Faith in Action Kern County, National Brotherhood Association, California Rural Legal Assistance, Greater Bakersfield Legal Assistance, and Children First. The Collaborative proceeded to develop a set of recommendations for the KHSD LCAP focused on ending the “school-to-prison pipeline” by improving school climate. The KEJC used a multipronged approach to address the issues including Grassroots Mobilization and Advocacy, Local Control and Accountability Plan (LCAP) Parent Trainings and Advocacy, a Public Awareness Communications Strategy, and Integrated Voter Engagement.